The Shofar is the ritual instrument of the ancient and modern Hebrews, the only Hebrew cultural instrument to have survived until now. Of martial origin, the shofar was a priestly instrument in Biblical times. According to the Mishna, two different forms of shofar were used in the Temple: one made of ibex horn, its bell ornamented with gold, was sounded at New Year and during the Yovel Days; one made of ram's horn with silver ornamentation was sounded on fast days. We learn from the Mishna and the Talmud that in the Hellenistic period no improvements or modifications that might affect the tone were permitted: no gold-plating of its interior, no plugging of holes, no alteration of its length (the minimum permissible length of a ritually approved horn was 3 handbreadths); the shofar tone was to be preserved unaltered. Nor was the process of steaming or boiling permitted. 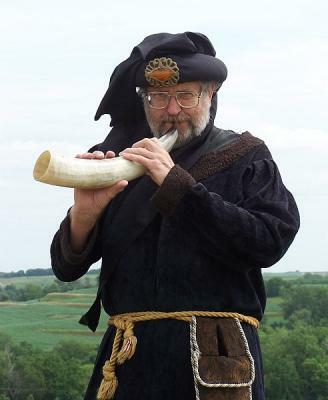 Apart from its liturgical uses the shofar was closely connected with magical symbolism. Its blast destroyed the walls of Jericho, and in the Dead Sea scrolls we read that during battles shofar blowers sounded a powerful war cry to instill fear into the hearts of the enemy while priests blew the six trumpets of killing. Historically the shofar has also served in a number of popular usages: it was sounded during rites to bring rain, in the event of local disasters, and so on. In our times its liturgical use is restricted to New Year (Rosh Hashanah) and the Day of Atonement (Yom Kippur). Musica Antiqua's shofar is really a bone cornette made from a horn of an African ox. It has six finger holes to aid playing notes between partials of the closed horn.